BEAUTIFUL & SECLUDED LAKE TARPON WATERFRONT HOME. UPDATED & COMFORTABLE LAKESIDE HOME, VERY UNIQUE & USED FOR MULTIPLE PURPOSES. UPSTAIR'S FEATURES INCLUDE 1 BR 1 BA W/LITE & BRITE UPDATED KITCHEN W/ A TILE BACKSPLASH, NEW SS GE APPLIANCES, & SS SINK. BATH HAS BEEN UPDATED W/A NEW VANITY & NEW SHOWER/TUB COMBO. THE TOP FLOOR HAS NEW LAMINATE & CERAMIC TILE FLRING. LG BEDRM FEATURES WALK-IN CLOSET. VIEWS OF THE COVE & CANAL ARE SPECTACULAR FROM ALL WINDOWS SCREENED/COVERED PORCH. BRING YOUR BOAT & MAKE YOUR DREAMS COME TO LIFE. LAKE TARPON OFFERS GREAT FISHING, JET SKIING & WATER SKIING. THE DOWNSTAIRS HAS PRIVATE STUDIO W/A SEPARATE ENTRANCE THAT COULD BE USED AS IN-LAW SUITE OR RENTAL INCOME. 1ST FLR STUDIO HAS NEW CABINETRY & BATH HAS WALK-IN SHOWER PLUS NEW VANITY. DOWNSTAIRS HAS WASHER/DRYER HOOK-UPS, STORAGE SPACE & CLOSET. DOWNSTAIR BACKDOOR LEADS OUT TO THE CANAL/SEAWALL AREA. 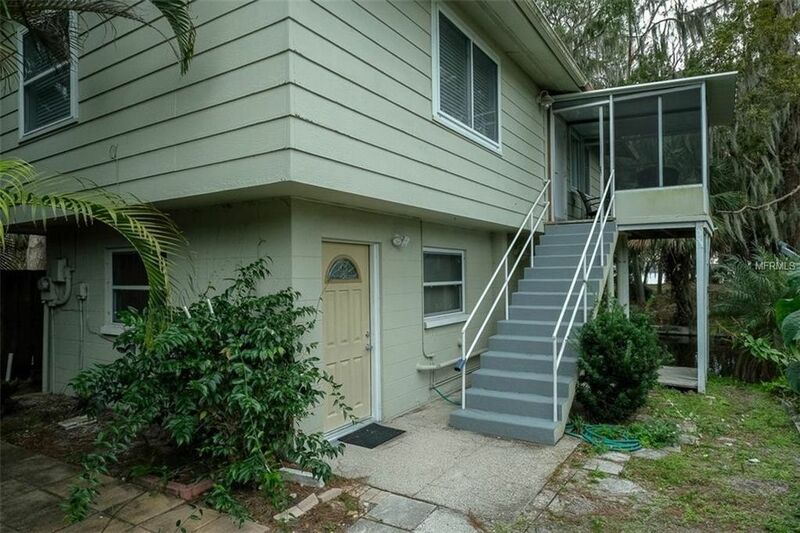 THIS AFFORDABLE, LAKEFRONT 2 BED, 2 BATH HOME IS LOCATED IN A NEIGHBORHOOD JUST SOUTH OF ANDERSON PARK W/A PRIVATE FENCED ENTRANCE TO THE PARK. TRULY A ONE OF A KIND 2 STORY LAKEFRONT HOME! OTHER FEATURES: TEXTURED WALLS/CEILINGS, NEWER DBL PANE WINDOWS, BLINDS, NEW INTERIOR DOORS, NEW BASEBOARDS & MORE! THIS NEIGHBORHOOD IS VERY REMARKABLE AS ANDERSON PARK WRAPS AROUND THE HOMES IN THIS CANAL FRONT COMMUNITY. EXTRAORDINARY WATER VIEWS FROM ALL WINDOWS & LUSH TROPICAL LANDSCAPING. LOCATED CLOSE TO DOWNTOWN TARPON SPRINGS, FRED HOWARD PARK, BEACHES, HISTORIC SPONGE DOCKS, SHOPPING, DINING & MANY MORE AMENITIES. Directions: US 19 N, EAST ON TOOKES RD, NORTH ON LAGOON RD, DRIVE TO THE END OF THE STREET TO PROPERTY ADDRESS 1212 Â½ LAGOON RD.